5 p.m. I’m this close to wrapping up Day 1 of the Baja culinary blitz! Just one French brasserie, a fancy pants Baja Med dinner, and we’re finally moving on to Day 2. It was a whirlwind of an adventure at the time, and reliving it again as I write has been spectacular. Tijuana really does offer much more than donkeys disguised as zebras and cheap shots of tequila on Revolucion. Our penultimate stop of the day brought us to L’abricot, a French eatery run by Maribel Villareal Sosa. 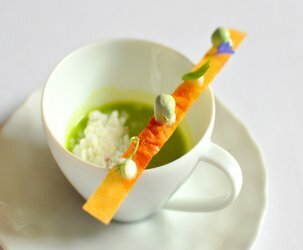 Chef Sosa honed her culinary chops in Paris at Le Cordon Bleu and Ritz Escoffier. 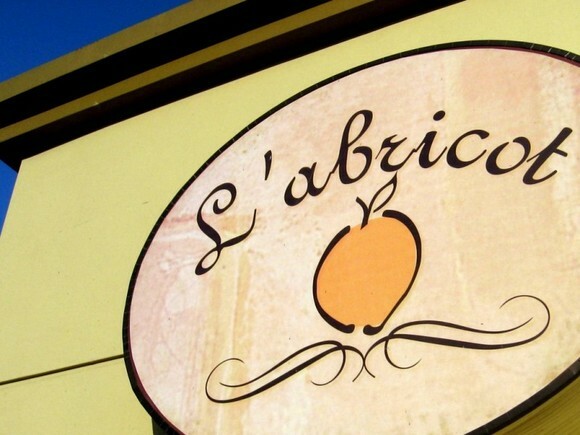 L’abricot is a charming spot offering classic French dishes and pastries. Even though we’d endured eight meals prior, the restaurant’s terrific display of sugary creations had our group gawking as we walked out to our al fresco table. If there’s one thing I learned on this trip, it’s that the mind and the stomach are oftentimes at odds. 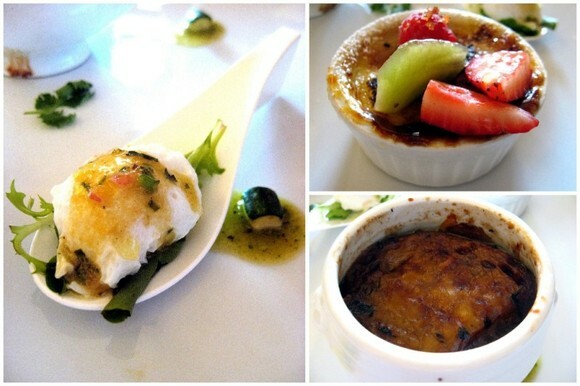 Chef Sosa prepared three dainty bites, including a poached quail egg with a Dijon vinaigrette (left), crème brûlée (right, top), and French onion soup (right, bottom). I wasn’t expecting a particularly strong showing from a French brasserie located in the heart of Tijuana, but each of the dishes was deftly prepared. 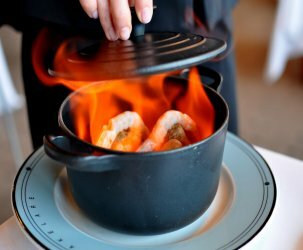 Underneath the French onion soup’s thick blanket of cheese lay a deep, rich broth with caramelized onions. The crème brûlée, with its teeny tiny black vanilla specks and perfectly candied top, had me sold. L’abricot is the real deal. Chef Sosa already had the group eating out of her hands, but to further seal the deal, she brought out plates of linzer torte cookies. As every glutton knows, two desserts are better than one. 2 desserts are definitely better than 1. 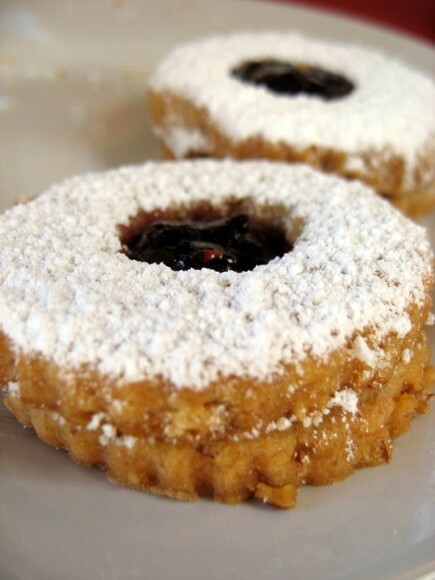 And Linzer torts and I have been good friends ever since I first had them via Pepperidge Farms. Yup. that’s a fact. What about 3 desserts? Does that fly? definitely impressed with this meal, and the decor was perfect. i’m not sure if i’d go back, but hell, for TJ, I’ll take it. I love the pictures you’re posting about the different kinds of gourmet foods you encounter. 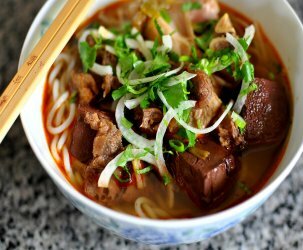 As a person who’s not formally trained in the culinary arts, but love cooking and creating some kind of food art, I really find the pictures inspiring. Certainly, I would love to try and create something like these mouth-watering creations, which are also so pleasing to the eye. La comida estándar… Excelentes pasteles. Una brasserie sin vino no es brasserie.